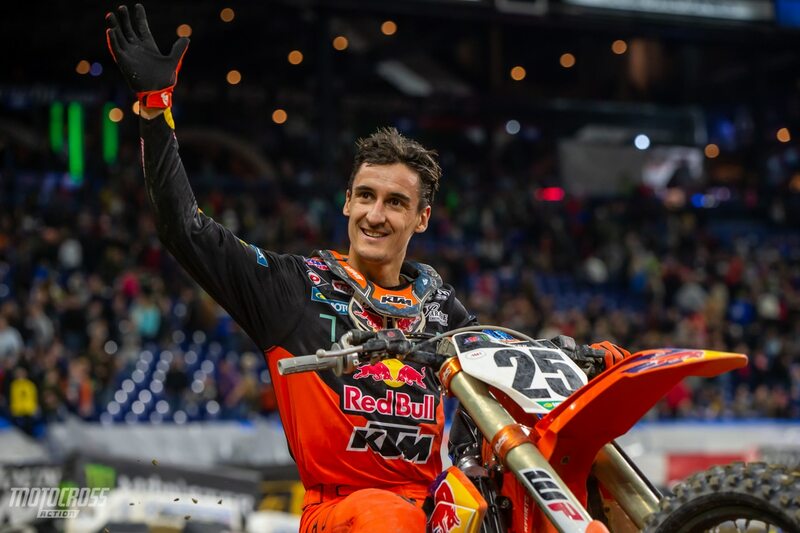 Marvin Musquin salutes the crowd after winning the 2019 Indianapolis Supercross. 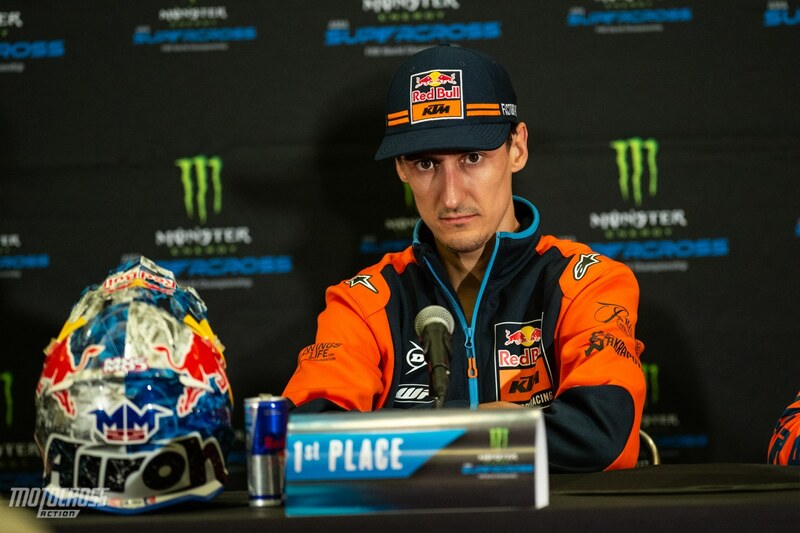 While we all knew he had it in him for a while, Red Bull KTM’s Marvin Musquin claimed his first win of 2019 this past weekend in Indianapolis. 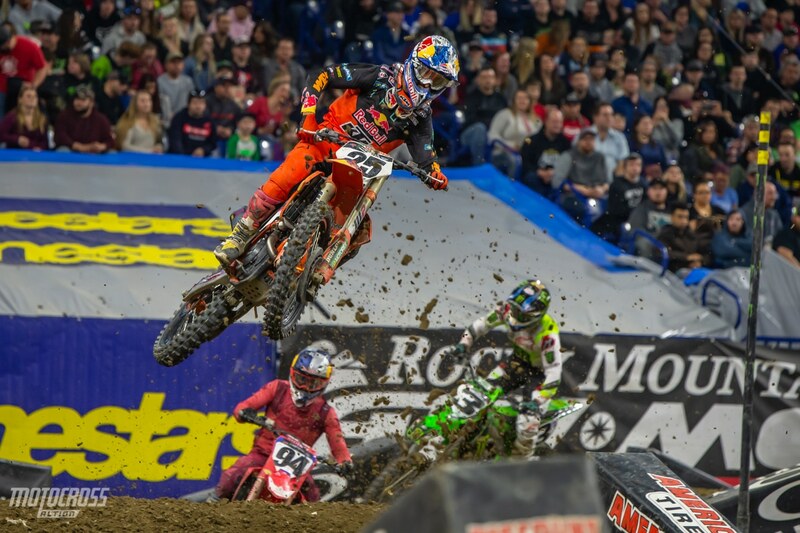 With his win, Marvin has moved to second in the Championship – fourteen points behind his teammate Cooper Webb. Could this Championship come down to a teammate battle? We caught up with Marvin after the post-race press conference to get his thoughts on the race, his season so far about battling with his teammate. 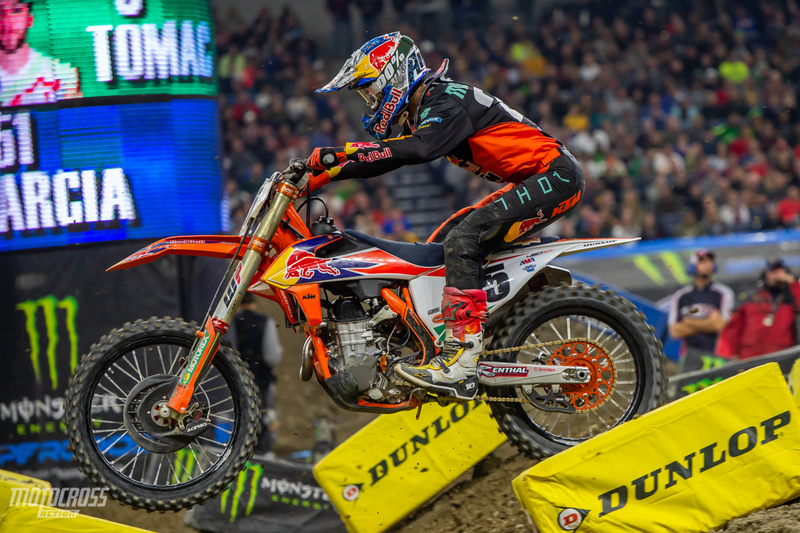 Marvin Musquin grabbed the holeshot and led every lap of the 450 main event in Indianapolis. But it wasn’t a boring race by any means, Blake Baggett and Cooper Webb kept him honest for the whole race. 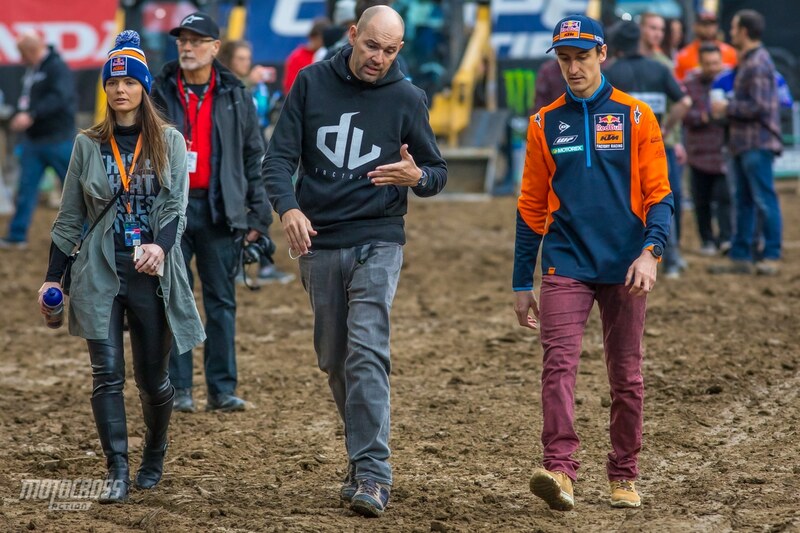 MARVIN, ALTHOUGH I THOUGHT I WOULD HAVE SAID THIS SOONER, CONGRATULATIONS ON YOUR FIRST WIN THE 2019 SUPERCROSS SEASON. Thank you, I feel that back a couple of weeks ago in Atlanta, I was definitely faster than those guys. It was super hard to pass there, so it was definitely hard. Maybe with a holeshot, it would have been different, but we will never know. Still, tonight I did get the holeshot and I was able to stay there. 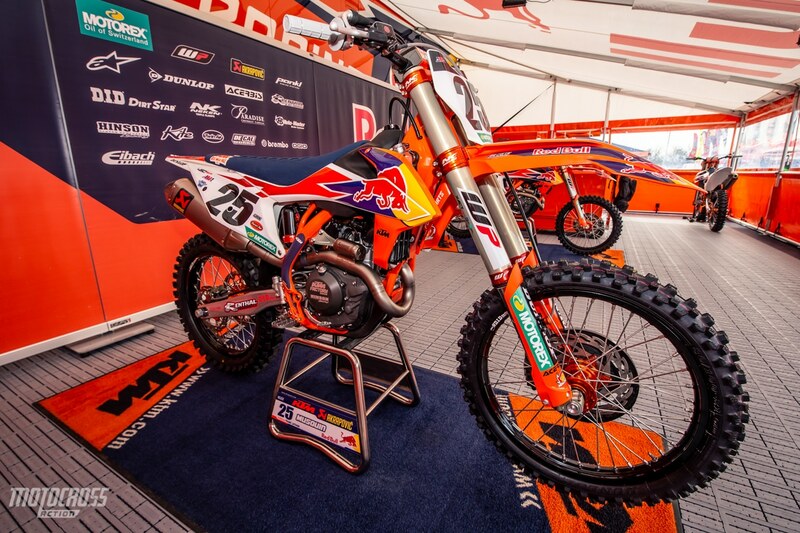 Although he didn’t get his first win until round eleven, Marvin Musquin is still in the hunt for the Championship. He currently sits second in the points, fourteen behind Cooper Webb. I THOUGHT FOR SURE THAT YOU WRE GOING TO WIN ATLANTA! Yes, me too, but I made a mistake and I got third. You know, it was just racing stuff, but those guys are smart. They learn and they know how to race too. Today, I was able to be up front. It was hard. I have never been in that position this season, so it was difficult to push hard. I was a little tired, stiff legs and stuff. It was not awesome, but still I kept it on two-wheels, and was consistent – and it was alright. Marvin and his riding coach David Vuillemin speak in code, it’s impossible to understand them, unless you speak French. INDY WAS VERY EXCITING, UNTIL NEAR THE END WHEN YOU GOT SOME BREATHING ROOM. Yes, exactly. It was hard, after ten minutes to go, all through maybe two laps to go, it was hard. but I got better in the section after the whoops. I knew I was clipping that jump and loosing time. I fixed that and it was better. And then Blake Baggett was not at my rear wheel, so that was better. Then I don’t know, maybe he made a mistake on the very last lap, so that gave me more breathing room and I was able to cross the finish line somewhat rolling. I was more relaxed. It was good, but yes, it was a tough one. I wish I had a bigger gap all the way through the main, this the biggest Supercross Championship in the world, so those guys us are strong and pushing hard. Marvin’s Factory Red Bull KTM 450SXF. 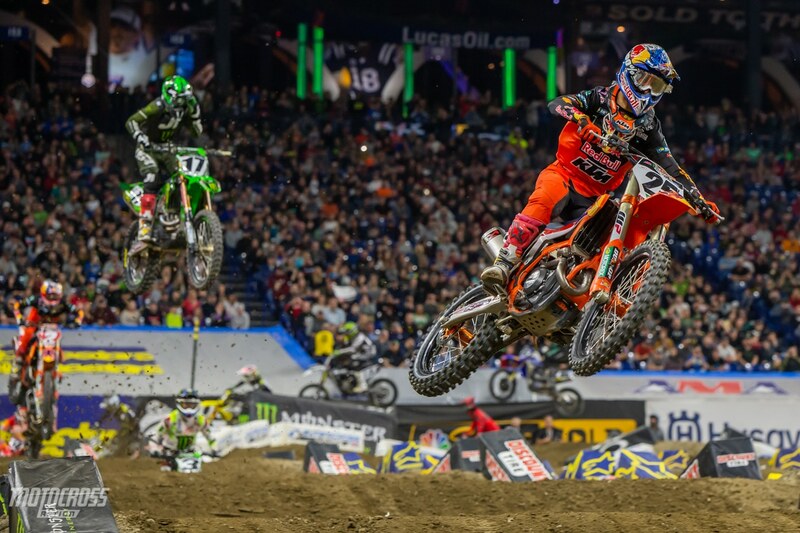 YOU LOOKED ESPECIALLY GOOD IN THE WHOOPS. IS THIS SOMETHING YOU CONSCIOUSLY WORKED ON? It is super important to work on technique, especially when the dirt is super soft. By main event time, it is going to be super edgy, hard to skim, and you’ll need to be consistent. It was like a V and you kind of have to jump and be creative. I was not quite sure if my way was the right way of doing it tonight, but at least I was consistent and pretty good. It’s definitely not easy. Every single lap, I was actually worried about making a mistake, but I had a good technique through it. Marvin has been riding with a new intensity this year. It’s clear that he wants to beat his teammate, but we haven’t seen any hints of a rivalry between the two Red Bull KTM riders. They both have kept it very professional with great sportsmanship on the track and in the press conferences. IT IS INTERESTING TO HAVE TWO TEAMMATES SO BE COMPETITIVE, AND RACING FOR THE CHAMPIONSHIP, BUT IT APPEARS YOU TWO GUYS ON GOOD TERMS. Of course, and it has to be like that. We train together, so there has to be some respect. The team is giving the best support for each other. People like to say number one guy or number two guy, but at KTM they are giving us the same bike, the same product, the same effort, and same everything for both of the riders. So, I have been really happy with the team and it has been awesome for us. Even after his win, Marvin is not fully satisfied. He’s looking to earn more wins and his first 450 Supercross Championship in 2019. WILL THIS WIN GET YOU INTO CHAMPIONSHIP MODE? I think so, yes. I have been doing well. Like I said before, I have not really had the results that I am looking for, but I have been doing good work during the week with Aldon, with the technique and the team, so everything is good. I just have to be there at the start. I won’t change anything, just keep doing what I am doing, and it’s going to be good.